Not long before his grandmother died, DeSean Stokes sat with her as she shared stories of her life. One of 15 children brought up in the segregated south, his grandmother, Evelyn, was the first in her family to go to college – Alabama State University, Class of 1954. She became an elementary school teacher, working for 50 years in the classroom. Evelyn was happily married to Isham Brown for 56 years and the couple raised three bright and successful kids. 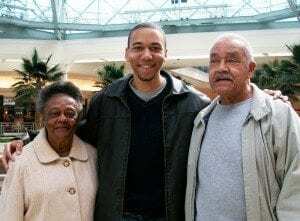 DeSean with his grandparents Evelyn and Isham Brown. When she died in early 2013, DeSean said it was her stories that kept running through his mind. He wanted to know more, not just about her but where she came from and the generations that came before. That’s where 23andMe came in. It helped him delve into parts of his ancestry that he wouldn’t have been able to find just from the stories his grandmother told him. “23andMe opened up even more doors to my ancestral story,” he said. An actor and musician, DeSean said much of his work involves telling or even inhabiting the stories of others. “As a musician and actor, my job is to tell interesting stories,” he said. But after his grandmother’s death, it was his own family’s story that he wanted to tell. “There is so much history you can learn about yourself and family just from sitting down and talking with your oldest living relatives,” DeSean said. Those conversations with his grandmother also inspired him to write a song for Evelyn. “Music is in my DNA — I live it, breath it and feel it in everything I do,” DeSean said. He played the music for her just before her death in early 2013. After she died he felt a need to learn more, not just about her but about her ancestors. His grandmother’s stories could only take him back so far. An African-American, he knows the history of slavery and what that meant – mixed-ancestry and very little information about where in Africa his ancestors came. Looking at family photos he also couldn’t help but notice the different shades of color in his family. It left him wondering. He’d heard from Evelyn and his grandparents about their families, but not much more. “They only knew the details of a couple generations before and the rest was unknown,” he said. Using DNA testing, DeSean could peer into the past that was locked away by time. From his 23andMe results he learned that his ancestry, was, not surprisingly, mostly from West Africa. But DeSean also learned that about a quarter of his ancestry was from Europe and included connections to the United Kingdom, Ireland, Russia, and Poland. He even found that his ancestry included Jamaican ancestry, Native American ancestry and Ashkenazi Jewish ancestry. Using 23andMe, DeSean has connected with newly discovered relatives from around the world.